For the second consecutive time, Theme 1 (Municipal Strategic Statement & Local Policies) contained in the ‘Discussion Paper’ for the review of the planning scheme has been neatly side-stepped and no discussion permitted. We therefore wonder how Council can ‘know’ what residents suggest, or want, if they haven’t even bothered to ask. What comments council officers have made in previous forums on this theme has been far from satisfactory. 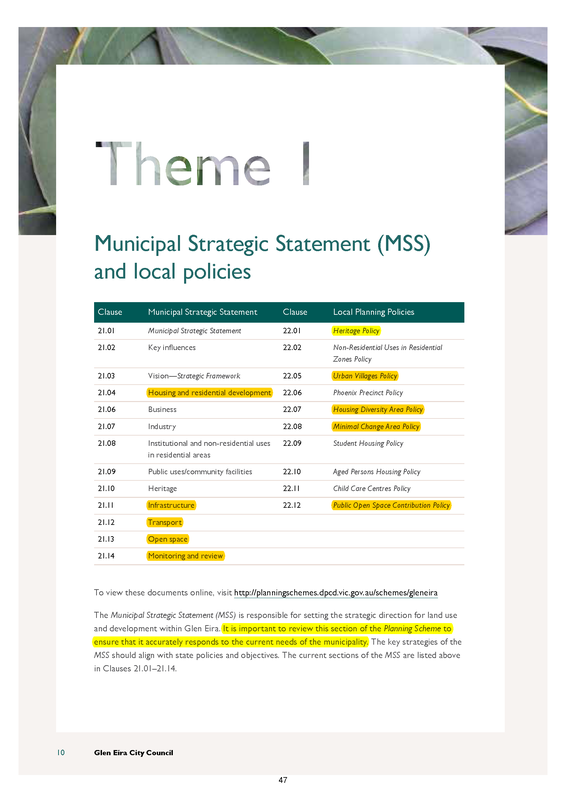 Torres simply admitted that the Municipal Strategic Statement (MSS) is well and truly outdated and will need to be ‘revised’. That’s it! Is this another Clayton’s consultation where ‘changes’ have already been predetermined but residents are kept in the dark like mushrooms? Who decided to discard discussion on Theme 1? Was Ms Turner given her orders to do so or was it her decision alone? Below is a screen dump from the Discussion Paper. Please note how bereft of detail this really is, yet how this Theme contains all the vital policies and which, of course, ultimately lead onto the zones and their schedules. From our perspective, it appears that council has done everything it can to avoid any discussion on the most contentious issue in Glen Eira – ie a review of the zones and their respective schedules. PS: also worthy of note – the only councillor to front last night was Lobo. No sign of Lipshutz at any of these ‘forums’ and Magee’s 5 minute appearance at the first one! Delahunty has also been a noticeable absentee. I attended last night’s session in Packer Park and was pleasantly surprised to see around 50 members of the community attend despite the weather. Hall acoustics were poor though, making it noisy and hard to hear. Saw several people criticize just how old and out-of-date statistics in the MSS were. Some comments were long-winded but overall generally thoughtful. It did seem like the facilitator and council staff were trying to steer the conversation away from one of the more controversial aspects of the Scheme: the new Residential Zones and how they were applied. Nobody explained why Council thought it necessary to have 85 years’ supply or how much money it would cost to provide the infrastructure to support that density. The facilitator inappropriately equated population projections with predictions. Projections are merely extensions of past practice through undocumented models. Again, no explanation of just how badly wrong past state government and Council projections had been. From last night alone there’s a huge amount of material to sift through and incorporate into proposed amendments. I’m not confident about what will emerge as any proposed changes could be interpreted as criticism of Council. You are dead right. Council cannot be seen as changing too much because that would be an admission of how badly they stuffed up the first time around and how little they have done since 1999 except rezone land after land and give developers a free hand. What comes out of all these forums will tell residents a lot about the new ceo and if councillors are feeling the heat with an election around the corner. All of the local policies need changing and many more should be added like a tree protection policy and a proper environmental policy. If nothing much changes then it is a very very clear message that we need 9 new councillors. Maybe the councillors were absent so as they wouldn’t be predjudiced by having the knowledge of who made the suggestions!!! Fair enough that out of 5 meetings some councillors could have previous engagements for one or two of them. They’ve got enough notice to change anyway if they really want to. If they haven’t shown up that means they don’t care or don’t want to be confronted by residents and will do what they are told by officers. Not good enough by a country mile. If I was a councillor I would make damn sure that I went along and heard first hand what people have got to say. Then I could with clear conscience say that I know what people wanted because I’ve listened to them. THE Melbourne Racing club will pocket $50,000 from leasing out carparking at Caulfield Racecourse for five weeks, despite paying only $93,000 a year in rent for the whole racecourse. Metro will pay the MRC $4 per spot per day for the 340 extra spaces it needs for commuters while rail works on the Frankston line are carried out between June 25 and July 31. The 54ha Caulfield Racecourse is Crown land. Work to remove three Frankston line level crossings is already underway at Ormond, McKinnon and Bentleigh. Ormond and McKinnon stations closed in March to be demolished and Bentleigh will close in early June. All three stations will reopen in August. When asked why Metro was paying to use State Government property, Metro spokeswoman Sammie Black only said the land was a designated paid car park and “safe for customers to safely park their cars”. “This carpark has always been paid parking. We are paying for those spaces so that customers can have free parking,” Ms Black said. Ms Black also told Leader the price of the car parks was “commercial in confidence” but Leader obtained the price from the MRC. Melbourne Racing Club general manager of racing Jake Norton said Metro were leasing the balance of the bays not leased by Monash University and Cabrini, known as the Guineas car park. In written statement, Mr Norton said the $50,320 collected from Metro would be reinvested into “amenities and benefits for its members, racing … and the community via maintaining the Caulfield Racecourse Reserve, MRC Foundation etc”. Some of the money will go to race day prizemoney. Level Crossing Removal Authority project director Brett Summers said they had worked closely with councils along the length of the project corridor to “identify practical parking arrangements” for train passengers during the works, and as a result will expand parking at five stations — Holmesglen, East Malvern, Glenhuntly, Huntingdale and Sandown Park. I don’t believe MRC does lease 54ha. The Auditor-General’s report pointed out that the majority of land MRC occupies is not leased. Clearly CRRT is has been financially negligent in its management of the racecourse precinct. check out Jim standing up for us on the racecourse for the next week. Will people get behind him? I wouldn’t stand behind, next to, or within a kilometre of Mr Magoo. The man has never worked for anything other than his own pathetic ego. The guy’s a sporting mad red-neck, with no answers to to anything other than stoking his own small town like ego. Expert host of this Blog-Roll, I defer to your deep knowledge and spotless accounts, so a question and comment please! Has Councillor Jim Magee ever raised a skerrick of a concern about over-population though over-development putting pressure on our public facilities? Or is he’s a gung-ho developers dream of a patsy councillor, that couldn’t put 1+1 together to make 2 with any consistently that could be judged as being rational. Expert host of this Blog-Roll another question and comment please? Would it be fair to say Jim’s vision for Glen Eira seems … to look and sound like a man obsessed with stuffing every single piece of open space in this city chock-a-block with buildings, carparks and concrete, without ever giving a hoot about children? Jim! do Rosstown and Camden residents a big chocolate flavour, and stay in Tucker Ward, as your narrow sporting mad mind has stuffed-up enough open space to disenfranchise generations of children to come. Obviously the government was going to choose late Friday afternoon to avoid scrutiny, but even by their notoriously low standards, it’s stooping pretty low to make changes that we can’t even read. Where the hell is the Incorporated Document? Not on levelcrossings.vic.gov.au Latest News, and their search engine is equally useless. Tried ringing LXRA but of course had to leave a message in the hope they might call me back. My current track record is 1 out of 4 calls returned. Will now move on to see if the Minister is comfortable explaining how he interpreted the relevant decision guidelines, why he thinks the development is appropriately located and designed in the narrower parts of the corridor, what the “relevant use, design or siting guidelines” he applied were, and how the “design response” addresses all issues raised in community consultation. Won’t hold my breath.